Beginner Classes – 9:45 to 11:00 a.m. – 108 Yang Family Long Form Class (Mornings Only). All Levels – Open Floor Practice (The purpose of this class is to continue to practice Yang Family Tai Chi techniques solo or with a partner) This class is for students only. 11:50 p.m. to 12:45 p.m. (All Levels) Open Floor – Forms /2- person / Tai Chi Weapons practice (must be a student and must to participate). We Offer Private Tai Chi Lessons for your convenience. Personal Lessons work great for either fast learners who get bored easily in class settings, or for the student that might be feeling overwhelmed in group classes and may need more one on one instruction. Either way you cant go wrong! The price of private lessons is $90/hour per person at our school or you can book a semi private lesson with a friend, for an an additional $40.00 more. What are the benefits of Personal / Private Lessons? *We can work at a slower pace or a more accelerated pace depending on your personal needs. *Opportunity to answers personal questions or concerns and to address certain issues. *Fast-track learning because of “one on one training”. *A personal program developed to quickly meet your needs and goals. *Gain a greater awareness, calmness, and overall sense of well being. Who Benefits from Private Lessons? All Athletes looking to improve their skills such as– Rock Climbing, Golfing, Baseball, Figure Skating, Running, Football, Ice Hockey and the list goes on. Individuals wanting personal Self-Defense instruction. People looking to improve their Technique, Forms, or 2 person Sparring/Drills. For anyone with health concerns, we can tailor the classes to target specific needs and Medical Conditions such as, Arthritis,Low bone density, Heart disease, Hypertension, Sleep Problems and Strokes to name a few. Anyone wanting to improve their Balance, Flexibility, and Muscle Strength. Students working on Tai Chi Certifications. Working professionals and retirees with busy schedules. 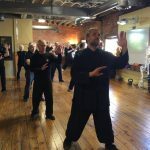 All Personal Lessons are taught by Sifu Michael Paler with 32 years experience in Chinese Martial Arts with a focus on Tai Chi and various Qigongs.